SEVEN HOTEL ROOMS OFFER A FRIENDLY, COZY AND COMFORTABLE AMBIENCE. 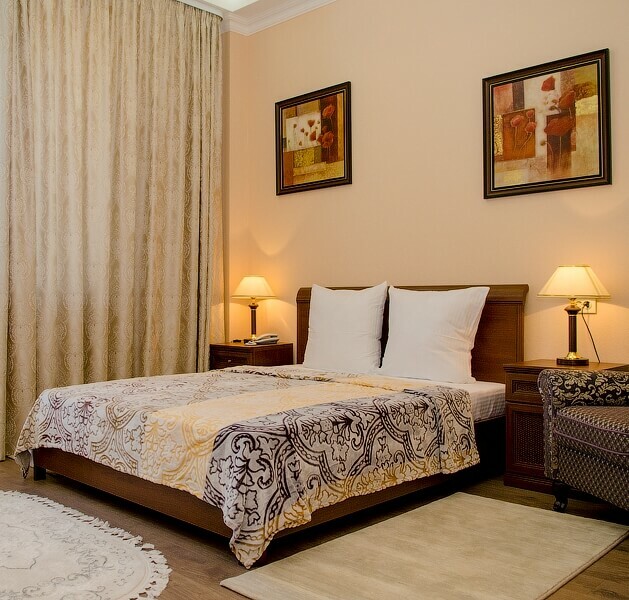 Situated in the Mitchurinskaya street, 2, in Rostov-on-Don, the hotel «Tesoro» meet guests’ high demands. Seven hotel rooms offer a friendly, cozy and comfortable ambience. The hotel «Tesoro» is located in the Mitchurinskaya street, 2, in Rostov-on-Don in 5 kilometres from the city center (8 bus stops), in 5 kilometres from the railway and bus station, in 8 kilometres from the stadium «Rostov Arena». At the moment there are seven hotel rooms which are available for guests’ accommodation. In future it is planned to put into service 5 exclusive two-level rooms, where sleeping area and leisure zone will be separated. Refined design in different color range and well-chosen original furniture are in perfect harmony together. 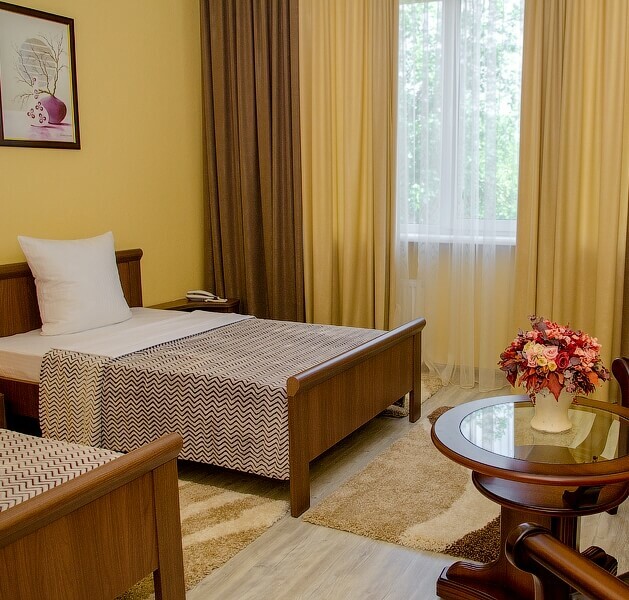 Guest rooms are classified as follows: «Comfort», «Standard», «Standard Plus», «Standard Double Room». 4 comfortable rooms (35 square metres of space in each room) with one double-bed (2 m x 1,8 m), bedside tables, an armoire, a table and armchairs, an air conditioning system, a telephone, a TV set, a refrigerator, a mini-bar, an individual safe deposit box, an individual bathroom, equipped with a shower unit, a washstand, a blowdryer, bathroom and hygienic supplies. A comfortable room (27 square metres of space) with one double-bed (2 m x 1,6 m), bedside tables, an armoire, a table and armchairs, an air conditioning system, a telephone, a TV set, a refrigerator, a mini-bar, an individual safe deposit box, an individual bathroom, equipped with a shower unit, a washstand, a blowdryer, bathroom and hygienic supplies. A comfortable room (25 square metres of space) with one double-bed (2 m x 1,6 m), bedside tables, an armoire, a table and armchairs, an air conditioning system, a telephone, a TV set, a refrigerator, an individual safe deposit box, an individual bathroom, equipped with a shower unit, a washstand, a blowdryer, bathroom and hygienic supplies. A comfortable room (25 square metres of space) with two beds (2 m x 1,2 m, 2 m x 0,9 m), bedside tables, an armoire, a table and armchairs, an air conditioning system, a telephone, a TV set, a refrigerator, an individual safe deposit box, an individual bathroom, equipped with a shower unit, a washstand, a blowdryer, bathroom and hygienic supplies. Standard time for check-in — 14.00, check-out – 12.00 (of next day). Extra bed – 24 hours — 1 500 rub. The guests who have their own car, can choose a secure parking; the possibility of a space within the hotel's territory is also available. The hotel’s policy of accommodation with children — It is possible to stay at the hotel with children of any age. A little table and other facilities for feeding children are offered for free of charge. A kids fun area is also available in the hotel. The hotel’s policy of accommodation with animals — Accommodation with animals is possible in the hotel. The hotel "TESORO" invites the guests of the FIFA World Cup 2018!